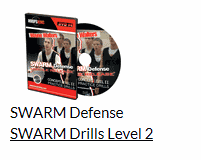 This basketball article is an introduction to Coach Wayne Walters SWARM defense, and his excellent DVDs that detail this defense. 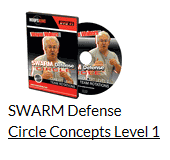 Coach Wayne Walters is the Founder and Director of SWARM Enterprises, the creator of the SWARM Defense and a veteran of over thirty years of coaching both genders from Junior High to Junior College. Coach Walters is the former Head Men's Coach at Thaddeus Stevens College of Technology. His last four teams at the JC level forced over 30 turnovers per game without pressing using the SWARM Defense on the way to four straight Championship game appearances. In this article, I'll present some of the basic defensive concepts and slides as an introduction. 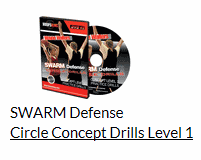 However, if you are planning on running the SWARM defense with your team(s), you must get the DVDs, which are much more detailed, with Coach Walters covering all possible scenarios, and also including all the many necessary breakdown drills. Why use the SWARM defense? Here are a number of Coach Walter's reasons for using the SWARM defense. Defensive sliding is slower than sprinting, and so asking less athletic players to slide on defense magnifies their lack of quickness. The SWARM defense emphasizes sprinting, not sliding, and expects players to play at full-speed. Players that are less athletic cannot play in front of players that understand triple threat and they will be ineffective in containing the ball. Players only pressure when they know help will come 100% of the time. There is a basic problem with "Help and Recover" defense. Notice in diagram A that when X2 helps on the O1 dribble-drive, O2 often slides to the corner and X2 cannot recover. This often results in a pass to a wide-open O2 for either a shot, dribble-drive or pass into the post. The SWARM defense is pro-active and actually attacks the ball, stopping dribble-penetration by forcing the ball-handler to pick up his dribble and pass, while other defenders rotate in a specified manner. Diagram B shows the offense in a 3-out, 2-in set (other sets are covered in the SWARM DVDs). X1 forces the ball to one side. The wing defenders, X2 and X3 are in the "sheriff" position with one hand's index finger pointing at his man and one at the ball, so that he can see both. The post defenders X4 and X5 are full-fronting, denying the pass inside. As the ball is dribbled toward the right, X2 immediately sprints up to double and stop the dribble-drive, while our other defenders circle rotate. X5 sprints out to cover O2, X4 sprints to O5, and X3 sprints down to O4. Often O1 will pick up his dribble resulting in a dead ball situation. Here, X1 immediately sprints out of the double-team and finds O3, closing out with high hands (diagram C). Coach Walters drills this extensively with his "chair drills". Diagram D shows the "Fist" circle rotation if the ball is dribbled left. The rotation is now counter-clockwise, but the principles are exactly the same. "Sniper" is often run vs high-low offenses that use a high post player. This is just a 3-player rotation... X5 stays with his man, and the dribble-side wing fakes a trap but goes back to his man. In diagram E, the offense is in a 1-3-1 set. As O1 dribbles right, X2 fakes a trap but goes with his man O2. Instead, X4 sprints up to trap and stop the ball, while X3 rotates to the high post O4 and X1 sprints out of the trap and finds O3 (diagram F). Notice that X5 just stays with his man O5. In addition to running this against the high-low, it can be effective after running "Fist" several times, as now O1 the point guard is expecting the trap from X2 and might be quick to pick up his dribble just on the fake from X2. "Sniper" can also be run vs the 3-out, 2-in and also vs the 2-1-2 offense. Diagram F2 shows basic rotation for "Sniper" vs the 2-1-2 offense. X4 fakes and floats back to O4, while X5 sprints up to trap, as X3 sprints to the high-post and X2 sprints down to cover the opposite corner. On the dead ball, X1 must find the opposite guard O2. Coach Walters goes into much more detail regarding these rotations, dealing with skip-passes and corner dribble-penetration in the DVD. The DVDs cover all possible scenarios. After encountering "Fist" or "Sniper" several times, a good offensive point guard will often counter by starting a dribble to one side, then backing up, or pivoting and making the open skip-pass to O3 on the opposite wing. "Twist" is a good way to counter that. Coach Walters describes it as a "change-up", similar to baseball where the hitter is looking for the fast-ball, but you throw him a slow change-up instead. With "Twist" there is no circle rotation... all help defenders stay at home with their man. X2 sprints up to trap as usual, but here X1 jump-switches and sprints to cover O2 (diagram G). Our helpside defenders all make a step fake as if rotating, but go right back to their man. So if O1 attempts the pass to O3, X3 in anticipation might be able to intercept this. Coach Walters points out that in the 4-out set (diagram H), "Twist" could be a problem if X2 comes up and out of the corner too soon to trap. This leaves his man O2 open in the corner as he is too far away for X1 to get there in time. Diagram I shows the correct way to play this... X2 does not come up to trap until the ball is at the free-throw line or lower. This way, O1 can easily get to O2 in the corner. So again, "Twist" is nothing but a jump-switch between the two defenders working the ball, and there is no circle rotation. Whenever the ball goes to either corner, we establish an inside "triangle" as seen in diagram J (X3, X4, and X2) and try to deny the pass back out. As O2 dribbles baseline, X3 steps up and along with X5, stops the ball along the baseline. X5 sprints out of the trap and finds the wing O1, while X1 sprints to the top O3. There are two ways of covering the opposite wing (which is not an easy skip pass from the opposite baseline)... (1) X4 simply sprints up to cover O4, or (2) X2 sprints over from the high post to cover O4 as X4 rotates to the high post player (double-arrows). This may work better if O4 is more of a scoring threat than O5. If O5 is the better scorer, use the first, simple rotation. Diagrams K and L show a two-guard front (2-1-2 or 4-out offenses). In this case, once again we have the inside triangle with X2, X4 and X5. X4 and X3 stop the dribble along the baseline. In this instance, we don't want X2 coming out as he has to deny the pass to the opposite corner O4. Here we have X3 sprint out of the baseline trap to cover the high post O5, as X5 covers the opposite wing O3 ("diagonal release" from the corner). Alternatively, we can use a "circle release" from the corner as seen in diagram L. Here, X3 sprints out to the ball-side guard O1, and X1 sprints to the weakside guard O3. Once again... ball in the corner, establish the inside triangle and deny. Diagram M shows the wing player O2 dribble-driving, baseline side. X5 steps up to double and stop the ball, as X4 sprints over to cover O5, X3 sprints down to cover O4, X1 sprints to O3 and X2 sprints out of the trap to O1... all consistent with our basic circle rotation. Diagram N shows how to rotate vs the hi-lo or 1-3-1 offense when the wing player drives. O2 dribble-drives baseline side. X4 sprints down to stop the ball along with X2. Much like "Sniper", X5 stays put with his man O5. X3 sprints to the high-post O4, while X1 sprints to the opposite wing O3, and X2 sprints back out to the top and finds O1. While we are discussing the 1-3-1 offense, diagram O shows circle rotation vs the 1-3-1 (although you may want to run "Sniper"). Here O1 starts the dribble and X2 comes up to trap. X4 sprints to cover O2 in the corner, while X3 sprints to the high-post O4, and X1 sprints out of the trap and finds O3. Once again, X5 does not circle rotate, but stays with his man O5. Coach Walters also discusses the wing drive from the 2-1-2 set and several other situations as well. This concludes the general defensive rotations of the SWARM defense. This article just serves as an introduction to the SWARM. Coach Walters really goes into all the important details in the DVDs. 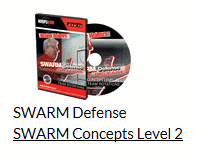 I have not presented anything here from the Level 2 Concepts DVD, so there is much more awaiting you there. Also here is a list of many of the break-down drills included in the DVDs. Chair drills ("Fist", "Sniper", baseline dribble, forming the triangle, etc). with Wayne Walters, inventor of the SWARM Defense, former Head Coach at Thaddeus Stevens College of Technology.